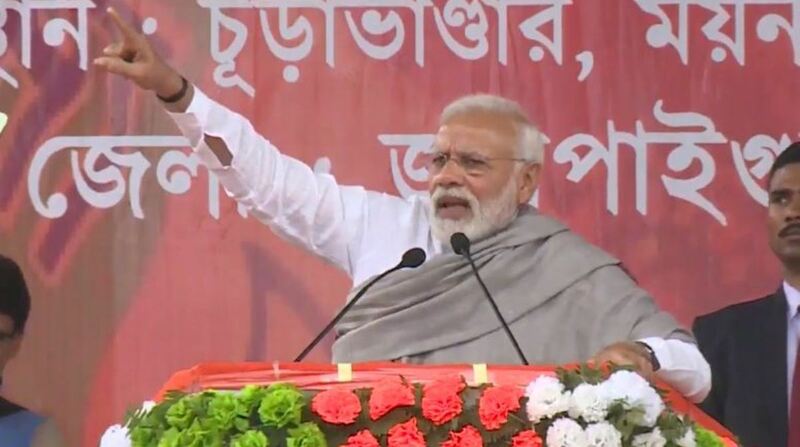 Addressing a public rally in West Bengal’s New Jalpaiguri, the PM said it is for the first time in the history of the country that a Chief Minister has taken a stand with those who looted the poor people. “Today West Bengal has a Chief Minister who is standing with the people who looted the hard-earned money of the poor in the state,” Modi said referring to the CM’s dramatic sit-in against Central Bureau of Investigation (CBI) attempt at questioning Kolkata Police Commissioner in connection with ponzi scam cases. “Didi Dilli jaane ke liye pareshaan hai aur Bengal gareeb aur madhyam varg ko syndicate ke gathbandhan se lutne ke liye chhod diya hai, (In her anxiousness to come to power in the Centre, Didi has left the poor and middle-class in Bengal at the mercy of the syndicate. )” the PM added. Assuring justice to the victims of the Rose Valley and Sharada scam cases, Modi mocked Mamata questioning her why she is “afraid of the probe in the chit-fund scams” and doing dharna for those who are accused of negligence in the investigations. The PM also attacked the Bengal government for its repeated refusal to allow BJP leaders to hold rallies in the state. “The Bengal government can welcome illegal immigrants but the leaders of the country’s largest political party are prevented from entering the state,” the PM said. 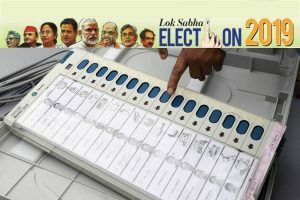 In the recent past, the government led by Mamata Banerjee refused to grant permission to choppers carrying BJP president Amit Shah, Uttar Pradesh Chief Minister Yogi Adityanath, and former Madhya Pradesh Chief Minister Shivraj Singh Chouhan from landing in the state. Adityanath had to take the road from neighbouring Jharkhand to reach a rally venue in Purulia. Chouhan, too, had to take the road to Kharagpur. Urging the people to bring back BJP with full majority, the PM also said that if his government had not come to power with overwhelming numbers the India-Bangladesh border row would have remained unsolved. The PM also slammed other opposition parties stating that while his government is trying to bring back from foreign countries those who looted the poor and scammed the armed forces, the ‘mahamilavat’ (grand adulteration, a twist on grand alliance) is trying to protect them. At New Jalpaiguri, the PM said that the law and order situation in North Bengal has worsened over the years. “Industries were not developed, youth are migrating, and projects of schemes are stalled, but all this doesn’t bother the West Bengal govt,” he said. The PM also told the gathering that workers employed in tea plantation fields will now be entitled to a pension due to a scheme announced in the recent budget. “This is going to benefit around 40-42 crore workers working in the unorganised sector. They will get pension after attaining the age of 60,” he said. North Bengal is known as a tea plantation belt of the country.